Some things simply do not translate. Today I stepped outside my office, it being Christmas eve, I was leaving early. A friend of mine, (born in PNG) was placing a box marked "FRAGILE" in his truck. "Frah jee lay ... ooh that must be Italian!" he paused and looked at me with a look that said "this is your mother tongue, and you can't even read that?" and replied verbally, "Fragile... it's Fragile"
I lacked the desire to explain my joke, I regretted having quoted the film to a man who had obviously never seen it... and nodded a polite "yes, thank you." Hehe... still couldn't resist the perfect opportunity. The Mape New Testament was recently dedicated in a ceremony. During which, the Mape people played out an "early missionary experience". Can you guess in this photo who the missionary is? -saved a translator couple $939.99 by troubleshooting an HF-radio modem and upgrading it's firmware, thus they didn't need to buy a new one for their village visit in January. This is the interesting one. He's heading into the village with a battery pack, a low power projector, speakers, and an ipod. He wishes to prove this will work, so he needed to get a dvd (non copyrighted) onto his ipod. I simply taught him how to use handbrake, very simple to me, but to him, saved him hours of head scratching and now he should be able to travel into the jungle with minimal equipment in his backpack... which is good since he has Cerebral Palsy. I tell you, being here, sometimes the things I think are so simple and come naturally, save other people a LOT of work and time, and are very appreciated. Vice Versa as well there are others here that help me in this way. I am constantly amazed at how God has prepared our skills for being here. I thank Him for any good ideas I get. And I wonder at the practical application of some of these gadgets that are out there. Honestly, this weekend was full of stuff breaking at home for me. It is really nice to get a few wins under the belt after one of those "Home Improvement" weekends when you get a few projects that don't go exactly right. Today the temperature in our server room began to climb, our air conditioner is dying and although we've had one on order for 6 months, it hasn't come yet. Well because of this situation we decided to start powering off non-essential servers. For the past 2 years we've been migrating dialup users to dsl users. So the quick decision was made to power off our Dialup users to save the heat, and convert the 24 modems to 8 since we seem to still have modem users. Mind you this is completely impromptu, no planning at all. problem 1 - the modem card inside the old Dell desktop running w2k3 server is disabled because it is incompatible with the external modem/serial bank. problem 2 - after enabling all the OLD modems we go to patch the phone lines and find that the cable terminated are the wrong type of cable.... we need an Rj4 cable on one end and an rj11 on the other. Where are they? So I began to bring up the server hardware while the others scoured boxes for these OLD cables. Woops. "sorry about this but we schedule a server maintenance that was supposed to be very very simple and in fact is turning very bad on us very quickly, could you drop everything and come help us?.. please?" he did, nice bloke that he is, and soon we discover that no dial tone means that the pairs weren't patched properly. Mind you this entire project is reverting back to what we used 8 years ago, because since then they upgraded the modem capabilities. We're now 10 minutes over our 2 hour window, and are manually repatching 8 telephone lines. Which means we're still not sure that our dialup server is functional. THIS is exactly the kind of thing you want to do on a Friday. It's sort of the old nightmare project, the only thing is, there is very little stress because most of our customers are on DSL now. Q: How many technicians does it take to revert a dial up server from 24 modems to 8 modems, thus reclaiming 6 rack units of space and about 1 degree of cooler room temp? A: 4. One to start the project, one to run around asking questions and grab tools while the other guy scratches his head and says "remind me why we started this project again", one to know exactly how it all fit together 8 years ago, and one to patch the telephony jacks. don't worry, I'm not actually sitting on dogs. This won't become a blog about cute little dog antics. I enjoy dogs, but would not call myself a dog lover. So when a friend of ours (a translator couple) asked if we could watch their dog for a month, I said yes. This dog is pretty smart, a 1 yr old German Shepherd mix. Well behaved, fun loving, good guard dog. I made a dog run for her, and put her collar on a caribiner connected to the leash. This morning she figured out how to bite it, to clip it open and get loose. Neighbors mated their dog with another neighbor and last night they had puppies, so we're hoping to soon have a new puppy, and we'll teach it to be a good guard dog for the house and a good friend for the kids. The kids are getting over their fear of dogs (some stray dogs attacked Calvin a year ago, didn't harm him but scared him), through the dogsitting, although the dog is still too powerful and can knock them over easily. I'm putting time into research on how to train dogs, etc... so that this experience will turn out very positive for us. This morning I woke up, readied for church, and checked my email. Our #1 main server was down. This server is a dell 1950 with 2 dual core processors, running a virtual machine, our intranet, and our ftp server. It has a powervault md on it, hosting 11 TB of data. That's 11 terabytes! So to wake up to the thought of this server being down, meant a LOT of data loss. Scenarios of disaster run through my head as I begin the trek to work. I start praying. "God please help me, I'm a month out of the seat, a little rusty, please guide me and heal this machine." I went into work, and the disk controller was complaining of losing it's configuration. GREAT... but .. um.. which controller is it? There are two, and if it's the big one, we've lost all data, if it's the small one, the server and all virtual machines, won't boot. A year and a half ago, we implemented a service called OCS, which inventories all our systems on the network. We very rarely need to refer to it, but this morning I did. The database showed me quickly that the complaining controller was our "C" drive not our "D" drive and I was relieved. Now... comes the scary process of pushing the right buttons. When you're skirting the line of total data loss you hate to have warnings like "all disks are missing press C.. if you press C this action can not be reversed... are you SURE?" and then "erasing configuration... this action will remove all data." ugh... several scary steps later, I see the familiar "Windows 2003 server" splash screen and I stand up, triumphantly pumping both fists into the air..
WOW... that was adrenaline. I went from being certain we had lost 11 terabytes of data to having not lost a single drop, and it only took 1.5 hours. Wow. On top of that, I was able to discover root cause which is hard to do in these situations, and hopefully we can order spare parts to avoid such a scary scenario again. Thank you GOD for answered prayer!!! 2 months ago our water tank began to rust out, water pouring from little holes. We blogged about it. We got an Instant Message from one lovely couple saying they were going to give us a one time gift. However the amount wasn't mentioned for various reasons. Well the water tank began to pour and I couldn't wait, so we prayed and a number popped into my head, and I began to search out the best deal I could for that amount, hoping it might match the donation. After several choices and variables (between types of tanks, shipping, assembly, installation... do I do it myself, how much do I do? etc.) We came up with what we figured was the most sensible solution. A tank that held a little more than the old tank, but was made more sturdy and would last longer. To offset the cost from a cheaper tank I would install it myself. Well the tank was ordered, and shipped and the bill came. After a few weeks we saw what the amount of the donation was... wouldn't you believe it... the numbers matched exactly. I mean to the penny. Purchase price, + discount + shipping + fittings for plumbing = exact amount of donation. So we returned from the U.S. with a new tank ready for pickup. All I had to do was figure out how to assemble and plumb it myself. Well, 4 days later, and several back breaking hours of shoveling in the heavy rain, and we today turned the valve on our new water tank!!!!! AND IT WORKS!!! Thank you to friends like you who sustain us and encourage us, and bless us! God constantly is using you to show us miracles time after time! Tonight was the primary school Christmas concert. The primary school beginner band played for an hour and the pc singers (sydney is one but missed this concert's practice last month) sang for about 30 minutes. Calvin had to go to the bathroom, so Kendal escorted him. It was one of those "I'm bored I want to go do something, moments." While walking back he said "mom, I'm bored." she replied "well we're here as a family I'm sorry you're bored, but you need to use your manners." "Let me give it to you straight mom, I'm sweatin' like a donkey in a haystack." we couldn't decide which part of that quote was funnier, the first bit or the second bit. Almost all of us, enjoyed the concert. Last year we started a tradition, we hid our little 4 foot christmas tree in the yard, and drove around sipping cocoa listening to christmas music in 70 degree weather. This year we carried on the tradition. Only I hid the tree and sign in a different yard. I really get into this, the more you make believe the more fun it is for the kids, and your wife! "Let's go hunting kids, but I always get lost driving up in this hill roads, so you'll have to look for the tree farm, maybe even shout directions." Bing Crosby croons in the background thanks to an mp3 player, and we're eating candy canes, it was too hot for cocoa. 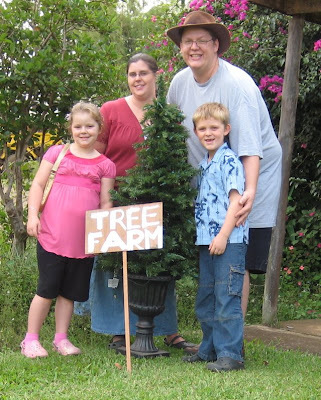 Finally after about 20 minutes of driving, the kids see a "tree farm" sign, we pull in, they hunt the tree down, and we put it in the car. (next year I'm considering strapping it to the roof... but I might get odd looks"
They enjoyed the make believe. I keep telling them "remember to water the tree" or "turn out the lights we don't want it to dry up." It's a cute little tree, and a fun new family tradition. Last year we mentioned thinking it would be the last Christmas with the kids believing in Santa. This year we had an interesting conversation as my son lost his tooth in the hotel room on the way back from the States to PNG. son - "well i guess tonight we find out if the tooth fairy comes to hotel rooms"
me - "do you honestly believe in the tooth fairy?" son - "no, I haven't for a while but I kept pretending so I could get some money." daughter - "but we believe in Santa"
son - "well I don't." daughter - "well I don't think Santa comes to Americans but Raquel (finnish friend) saw Santa, and saw an elf coming into our house last christmas. daughter - "well, I'm confused because I know Santa isn't real but Raquel has seen him, so I think he's really real for Finland..... or it could be someone dressing up I guess like they do for Americans." Our explanation "Santa is a myth that children tell their kids to make things more magical, like the tooth fairy. If you didn't have any reason to look forward to loosing a tooth, then it wouldn't be very fun to lose one would it? And since it is part of the magic, we don't want to ruin the magic for other people by telling them about Santa and ruining it for them.... although apparently that wasn't a concern of Raquel's." My #1 concern this last month was how I was going to handle doing sound ministry (on the side) by myself without letting it take over everything I was doing. -3 packages of donated sound equipment! Also today I went into work, and things have progressed well with my projects, but I was grabbed and asked "can you do a presentation in 30 minutes to the new recruits for orientation?" Sure, why not, I'm still jet lagged and unsure if I can remember names and passwords, but sure. And it went well. We informed them for an hour and I was able to answer all the questions, so.. really I hit the ground running today. Kendal woke up at 4am, and headed for school, she's needed because the helper teacher got very sick. Now months ago, I told my wife trying to hussle and change plans to be here on a Monday instead of a Tuesday seemed silly to me. But she was resolved to be here for Monday. Turns out, it's a God thing we were here because the teacher got very sick over the weekend. So not even 24 hours off the plane and we're once again confirmed that we're meant to be here, and we are used, were missed, and we're needed! Thanks God for the encouragement, and to all of you for making it happen! We are now safe and sound with luggage in tact, back in our house in Papua New Guinea. It was a relatively problem-less trip, that took us weds, thurs, friday, and Saturday. Several things went well for us during travel so your prayers were answered and appreciated. We received some good news upon returning... one of our friends is pregnant! Also, some sound equipment donated has arrived, AND the best bit, is that the old sound manager returns next month so I won't have to do sound for conference, this is a large load off our backs as in March both Kendal and I have multiple roles of responsibility and I simply didn't know how I was going to be both the sound manager and the technical project coordinator for this massive once-every-two-years conference that we hold. But... God knew of the issue and is providing relief... so I'm very thankful for that. We left, needing a rest, needing good news of more resources and we returned to that, yes some sadder news, friends with health issues and such, but mostly good stuff. very happy to be done traveling for a while too. We had a few hours to visit in Sydney (pics later) and we hopped off the plane, didn't even check into a hotel, got on a bus shuttle, to a taxi shuttle, to a train to a ferry, then we visited the Sydney Aquarium, which took us under water to a shark tank. That's an amazing boast by anyone's standards. Praise God we're safe, all our worries are relieved, and now we are excited about starting up our work again this week! Jet lag? only a tiny bit. Leaving home, is like punching family right square in the gut, and then punching ourselves in the gut. Emotionally, it's painful to tear away and say goodbye. My mind goes to things like.... I won't be around to protect, to see kids grow, to hug. I'm so glad for my family and how my sisters have kept their kids in touch with us so they didn't forget who we were, which is what we were expecting. It doesn't seem right to punch the folks in the gut, like that. It seems like a wrong thing to do. It feels, wrong. But doing what we're doing feels right, it is right. So there are two things I do when I have to say goodbye. First: - I recognize that it stinks, and I say to God "God this hurts and it stinks, but I am offering it up to you as an offering, it is a sacrifice, and I am thankful that I have something to precious as a close knit family to offer to you in praise." 27Jesus looked at them and said, "With man this is impossible, but not with God; all things are possible with God." 28Peter said to him, "We have left everything to follow you!" 29"I tell you the truth," Jesus replied, "no one who has left home or brothers or sisters or mother or father or children or fields for me and the gospel 30will fail to receive a hundred times as much in this present age (homes, brothers, sisters, mothers, children and fields—and with them, persecutions) and in the age to come, eternal life. 31But many who are first will be last, and the last first." "Dad, leaving is like when you first wake up in the morning, you're grumpy and you don't want to wake up, but you have to because it's good for you and you have to eat breakfast and do your work." It's not a part we enjoy, saying goodbye, in fact, it is the absolute hardest part of this journey. It is something that every fibre in my body tells me is wrong. I feel as if I am abandoning family and friends, I have always wanted to be the rock to be there for them, when things go bad. We feel as if we're missing out on the most important part of family life. But now we have been uprooted, and are not as available for them, and so, for me I have to depend on God that He will provide for them, for you, and we pray for you because doing so reminds us that all that hurt we feel in leaving, is something we have to give over to God... and He lets us feel that, and we adjust our attitude to make it a praise to Him. Sometimes when it's harder it means even more. We are preparing to return to PNG, we're getting pretty good at saying goodbye. But before we go I thought I might take the chance to answer a lot of the questions people have been asking us. Before I do that, I would like to preface this blog entry with a thought. We love America. Yes there are things that upset any citizen, but as a whole we love this country, and our answers are not condemnations of American culture at all. It would be hard to condemn a lifestyle we lived, we live on breaks, we enjoy and one which houses all of you who support and partner with us. In our hearts, missionaries who move away and return hating their home country is very similar to folks dogs who like to bite the hand that feeds them. If it weren't for the freedoms enjoyed here, we wouldn't have people who have the ability to support us as you do, and we are thankful for that. (also, we really miss this place when we're gone). -What food did you miss the most / enjoy the most during your visit? -What did you think you'd miss but didn't? -What did you miss the most? -What has surprised you about returning? Kendal - not a whole lot, was easy to pick up where we left off with relationships. Chad - Large flatscreen tv's in HD, tons of info during football games. -What was it like to go shopping? Chad - I found it difficult to be confident that I was finding the best price. -What has changed the most? Chad - nieces and nephews and young children of friends. -Have you stayed in tune with the election coverage? Chad - yes, and was able to vote in the presidential, but was not as worked up about it as most folks seem to be due to lack of news coverage/immersion. -What do you want to take back with you? Kendal - how many people can I fit in my suitcase? Chad - continued confidence that we're meant to be in PNG, and we are. -What things do you have a hard time getting in PNG? It started off with a wedding. We were able to come without using financial partner funds. It will end with the funeral of my great uncle. My daughter has fallen in love with High School Musical, my son has gained 8 lbs in pizza. The kids still all get together great, and seeing friends and family was fabulous. We've compressed a year's worth of living into a month and it's been very very busy. We're excited and rejuvinated to return to PNG and are sad to leave at the same time. Culturally not too much of a shock, although it does seem that we've been missing that overall pressure to be good consumers. The pressure to "buy now... save $$$" has been absent in our lives even though it seems an integral part of us, and we do occassionally feel like "consumer Americans" where we live because those around us know how to do without much better and put us to shame. It is all part of adapting to this new lifestyle. Stopping that voice in your head that says "I NEEED this." Still we're going home with a few things that should make Christmas special, and we've let the uncles and aunts and grandmas and grandpas spoil the kids because they don't get the chance to spoil their grandchildren very often. As a result, our kids have ocassionally forgotten their manners but not overly so, and I'm sure they'll re-integrate in PNG perfectly well. They seem to be pro's at that. It's been a heavenly month. We're excited to return and hopefully use some of our new energy exciting our friends around us and sharing some of the enthusiasm we've received in being here. Today we will be eating foods we haven't had in a long time. My brother's smoked turkey, my dad's ham, my sister's home made rolls, my mom's pumpkin pie, my grandma's dressing. As I drove down the street and saw the fall colors and the leaves on the ground, and smelled familiar smells, I suddenly realized what we had left. This last month has been a whirlwind. It began with a wedding. That took a lot of energy and was a lot of fun. Then we began a series of visitations and dinners, seeing friends and family. We threw in some shopping for items we need restocking on, or have missed, some christmas presents to take back. Today seems to be the first day I've taken a moment to reflect on the month. Our time here will end with a funeral as my great uncle passed away this week. Thinking about what I'm thankful for has a much deeper meaning for me this year than it has in past years. Because this year was the first complete calendar year of my life when I lived completely dependent on God to provide everything. My eyes water a bit when I think about leaving family and friends again. I may miss some of the food, but I won't miss much else other than the people. We expected to miss a lot of things. Ice-cream, steak, malls... but in truth, the only thing that we truly miss was people. It was very nice to be here and see folks. We are deeply honored the God would enable us through you to be a part of His plan to bring His name to Papua New Guinea. We are deeply thankful for you who support us to be here, in prayer and in finance, knowing the difficulty this country has seen in recent times. We are overwhelmingly aware that God doesn't need us to accomplish His work, but He chooses to let us be a part of it, so we get to see Him glorified through our actions. What a good year this has been. It hasn't been an easy year, but it has been a good year, glory to God. Have a good holiday season. about 1 month after arriving in PNG I scratched my new eyeglasses rather badly. Today I had an eye appointment with my regular eye doctor since we're home for a short break. We do not have vision coverage because it didn't make sense for us to enroll yet, we will enroll before our furlough. So I sit in the chair, the Doctor comes in, friendly guy, I've always liked him. He says to me, "What do you do?" At this point I always have pause. Do I say, "missionary" "computers" "volunteer" ? What would best communicate to this man the way he is expecting. The missionary thing usually throws folks off and they aren't intending a 20 minute conversation, but at other times it creates opportunities to speak to people. So I say "Well, I'm a missionary"
he brightens up "well God bless! I believe! Yes sir, this world needs spiritual healing. I admire anyone who puts other people before themselves. What can I do for you today. I have missionary friends." He asks what I'm there for. "Well I don't have vision insurance, I need to repair this scratch as affordable as possible, I'd rather have you do it and cost a tad more because I know you'll do it right." "Give Chad the missionary discount. I jsut made it up. the exam is normally $100.00 charge him $45. The lenses normally another $150, charge him $75.... and get them to him by Friday." That's cheaper and less hassle than had I gotten it done in PNG. Man, I tell you, it may seem silly, but that pause for me after "what do you do?" is still part of me adjusting to this lifestyle. I hesitate to startle people like that, but it seems to me that when I do, God steps in and says "see, that wasn't so hard, now I'll bless you." no more crossing the river, or not crossing it if the water is too high. Praise God, we can cross now! "thank you so much for doing what you do here, I want you and your husband to know, I hold in my hands what I hope is the final edition of our language project's Mark. You had a hand in this, you helped put this together. Thank you." a man named Oompiwi approached me the other day asking if I happen to have a spare door from my preschool project. This is the project where I'm supervising the remodel of an old preschool into a new programmers building. I in fact had 2 doors. His house had recently been damaged by a tree and his front door was smashed in. Since I had doors and since he has worked loyally for us for years, my instinct was to "give" him the door. But, that would cause several problems (aka 'hevis'). First would be that several people may come to me asking for free scrap, or even feel free to take. Second would be a gift to him would create "dinau" or a debt for him. So, I said that the door would cost him 5 Kina. That is about two hours of work for him. He agreed. I felt odd about it. A friend said "I'd like to buy the door for him" and paid me the 5 kina which I never truly wanted. Now, I have no idea what culturally this means. So I tell this man an anonymous donor has purchased the door for him as a gift. The response I got was not gratitude, it was confusion. What I was telling the man was "a man, I don't know what man, has paid for this door, you can have it now." He seemed confused, but glad to have the door. In the back of mind I'm wondering... if this man is going to come back to me with a lot of questions, or bananas or something in the near future. This is jsut another example of how living here is like a puzzle. If it were you or me, I'd say "sure take the door, don't tell anyone where you got it, I don't wany any problems". Here I had to put a whole lot more thought into my actions, so that I didn't turn a gift into a burden for this man in his culture. The economic crisis is worldwide now. The Australian dollar has declined, and while that is good news for any U.S. residents visiting Australia, it's difficult for some of our friends here. We've heard some reports of friends in the states who seem to be faring okay. Our prayers are with you during this time. Over here, the cost of living has been slowly going up. Each different department has had to increase their charge for things, primarily because of the increase in fuel cost, and the bridge being out. -Praise God because people answered our request for donated sound equipment! -Pray for protection, emotional stability, and energy as the enemy is trying to wear folks down around here. Goes to show God is moving! -Pray for our income that it will be able to keep up with the cost of living, we have been cutting back on things as much as we can, but we have found that we are still a few hundred a month below what it is costing us to live here. At this rate our personal savings will deplete quickly. We are trusting in God as always, to provide through you all, but are hesitant to ask for an increase since we feel that if you are affected financially at home, we should also share that burden with you. If God wants us here, He'll find a way to supply. We could pray creatively for a drop in fuel prices, a repaired bridge, a drop in the cost of living. We are so thankful for all of you, and our prayers for you are for security during this time of economic turmoil. Thank you very much for being a part of this ministry! Without you, there would be young children not receiving education, people stressing about broken computers and network issues, zero communication between families, Bible translation slowage, and many other things that God is doing here that we can't even count. This lady from Hagen, was at the culture festival some of my friends went to. Notice all the different feathers from different species of birds, and also notice that even the whilte paint on her face is made to look like a gull diving for it's catch. The ornate work these folks do is always astounding to me. What's even more interesting is that you can always tell when a festival is on, if you're near one because the guy who the day before was walking down the road in jeans and a t-shirt is fully made up and walking to the festival carrying a drum or something, in the same manner as he was walking before. As if you and I were to put on a suit or nice dress and go out for the evening, this type of look is their cultural dress up, and while it seems so exotic to you and I, they tend to wear it comfortably, as if it was a nice day out. So the other day I was out driving in the dark and I realized my reverse lights were FAR too weak to see the road at night. I needed a remedy. A friend of mine heard me say this and said "well I jsut took two lights off my truck, one is broken, but if you can figure out how to mount it, it's yours." So I figured, no worries. First I needed to figure out how to make a bracket giving that a) I'm not a welder b)finding the exact parts you want here is not a matter of going to the right stores, it's always about scrounging and creativity. We do have stores, not many but some, but they are distant, or they don't have what you need, or both. With stores here it is always, "I need X... but I could also get by with modifying Y and Z together." Or you could wait and have stuff shipped from overseas. The tinkerer is the person who gets things working, even if it's not always pretty. In a way I take pride in the ugliness of some of my solutions. So in the hardware rather limited supplies I found a galvanized elbow joint, 2 hose clamps, and a bolt w/nuts. 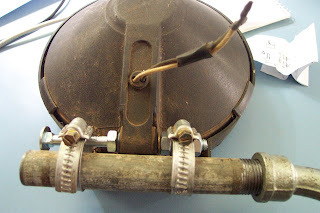 I then proceeded down to a field of junk with a friend who had a pipe cutter, and cut a length of pipe, brought it up, viced it, and then ran a manual threader on it to thread one end into the elbow joint. My other option was a $10.00 brass threaded pipe. This new option cost me 33 cents! THEN I proceeded to mount the entire thing through the spare tire mount I have on the back of my truck, through a lug nut hole... so it's removable. Then I ripped some cabling out of the back room where we keep piles of old electronic equipment, and spliced it off of my reverse tail light. So now, when I put it in reverse, I can SEE the road. but it took me 3 hours to get all the parts together to make the bracket, and install it all, and a little bit of walking around to find all the right places. Sometimes tinkering is a blast, other times it's not, but one thing is for sure, it's always necessary. 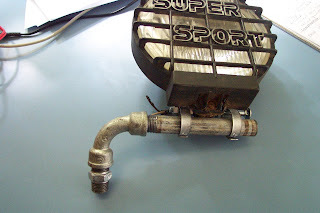 Had I known how to weld, it would have taken me about 30 minutes and cost $0.00 but it wouldn't be removable! well this week has been a very busy week from the network perspective. Tuesday we made vpn access from the outside world work. Thursday (today) we were asked, if we could make the primary school, link to the high school but keep it a separate network. We've been working on this project for weeks, but alas, it was all working until we found that Active Directory did not work on a Windows server that was dual homed and had it's default gateway facing the opposite side. So.. being that we had to use Isa2000 on this older server, we had to solve this issue today. Only catch is, school started yesterday, and we've run out of time. All was well until we came across this odd issue. So... we were looking at a major network reconfiguration, but we had 2 periods to do it in . 8:30-9:45 and 9:45-10:30. Well, it required we get a router which we didn't have, disable the second interface on a windows server, and rewire everything. We don't have a router, so we used a spare firewall, netscreen 10. Can you wipe out a firewall, rebuild it, configure it, and get it all working in under 45 minutes? It was a fire drill for sure, but it got the juices going. Anyway, it's all working now, albeit we're using a fw simply as a router... but hey, beggars can't be choosers. read and understand the New Testament Bible in their local language. Kopiago of the Southern Highlands province. but to make it become part of us in our Christian journey,"
spiritual was the Bible they had. Hording as a Spiritual Gift? A funny part of living here is hearing stories of what people packed that they heard they could not get in country. I packed mini-dv tapes and printer ink. A lot of it. I bought it in bulk before we left so that it would cost less, and I brought a lot of it here. Good thing too, because it's hard to come by and pricey. The funny thing is, I've used maybe 5 of the 30 tapes I've brought, and 3 of the ink cartridges I brought. Now, 1.5 years later we're sort of laughing at our surplus of ink and tapes. We could easily have gone this long without such a huge supply. But we didn't know, we were rookies of course, novice, naive. Now SOCKS, I should have packed more SOCKS, I haven't adapted to the "barefoot" culture. "I'm leaving for home and need someone to help me print 200 copies of my newsletter in color." well we had ink, so we said "sure come on over." "we need to videotape our Bible Dedication, but we have no blank mini-dv tapes... can anyone help us, we need at least 5 tapes, today!!" What are the odds that anyone would have such a surplus of mini-dv tapes? I called them up and said "we live to serve, come on over." I don't recommend hording items as a practice, but it is interesting that the things we tended to over-stock actually came to some usefulness to the community here. 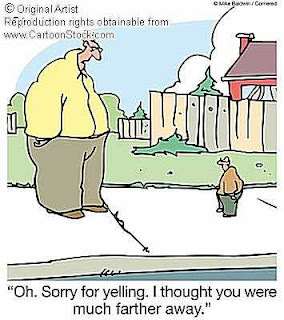 Folks around here tend to pull together in this way. Yes we have to be faithful to those who support us, and how we spend our money, and not all of us can afford to be financially generous, but as a whole, the believers living and serving together, we really do rely on each other to get by here. It is nice to live like that, in a community, a neighborhood that pulls together. this morning a free-flying white cockatoo (I think, here we call it a kokee, and it looks like a white parrot) landed right outside my bedroom window, at 6:40am or so. so I jolted awake to what I thought was a screaming child's voice yelling out "daddy daddy daddy!!!!!!" my wife and I jolt awake... confused, who is screaming???? and finally my wife says "it's the kokee." I tell you, I love birds, but I entertained thoughts of a kokee bbq for a few seconds there. the kids had a "water day" where their club they have formed met. It turned out to be the day I was supposed to exercise the fire truck, so I took a low pressure hose and sprayed the kids down a bit, they loved it. Then on Sunday we went on a "gumi" ride down the river. It was a lot of fun seeing them ride inner tubes in 3 feet of water down the river for about an hour. We passed through the jungle-y area seeing nationals living all around, waved and shouted hellos "apinun!" it was a very fun time. a week or so ago my daughter asked "daddy why did God create accidents?" last night she asked "daddy why did God create punishment? He created everything right?" and right after my son asked "daddy, where did the first germ come from." His idea was that when Eve bit the 'apple' that the rest of the fruit gathered germs, and that was the very first germ. He had it all figured out in his head, because germs can cause death and sickness and before the sin, there mustn't have been germs, so after the sin, when the 'apple' was bit, there were germs left on it. His reasoning was impressive, and I didn't have a quick answer, so we left it there. But then it dawns on me, that these questions have a bit of a negative tinge to them. So I say "kids we've been talking a lot about some of the sad things we know about God, let's talk about some of the glad things." So I read to them in Revelation about the thrones, gold crowns, sea of glass, rainbows, jasper, emeralds... to excite their imagination. "and the great thing about all of that is.. .what? ... who gets to see it?" expecting them to reply in unison "we do, believers in Christ do!" instead they paused... thinking... and then a moment later my son says. "dead people. dead people get to see it." We have a photo board here, and I'm one of the resident jokesters. On this photo board today I found a picture from 5 months ago, and a picture from today at 12:50. 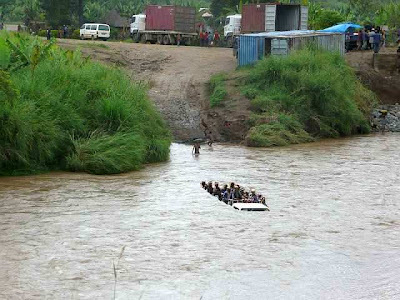 The old photo was the river low, with a PMV crossing (a pickup truck with a ton of people riding in the back of, the PNG equivalent of a public motor vehicle). The new photo had the water that had risen about 3 feet or so. So I mocked up a really bad photoshop photo of the pmv in the water up to their necks as a joke, put it on the photo board. "don't try to cross the river today"
"why, I saw a pmv do it moments ago" and put the picture up, as a joke and even put it was a joke. apparently the national employees here laughed hysterically at this photo thinking it real, and not knowing about photoshop. They laughed because PMV drivers have a reputation for being crazy and this photo proved it. The ex-pat managing hardware wrote me "it took a bit of explaining for them to realize it was a joke photograph... good one." I didn't mean to cause confusion, but I don't think I did. I wrote "do not try this" in big letters so they would know it a joke. Still that's the first joke I've ever made that crossed boundaries... usually I can get the nationals OR the expats laughing, but rarely both at the same time. Today, ten minutes before closing, there comes a very polite little knock on the door. A Korean gentleman had been wandering around seeking help and one of the ladies directed him to me. I had no idea what he wanted, his English was poor and my Korean doesn't exist. he did, so we spoke in tok pisin. 5 minutes later he was happy and gone. He apparently was trying to sign up for network services home DSL, and didn't know how to say it in English, what he kept saying in English was "I want an email alias". "me laikim yupela givim me sompela ..uhm... DSL i go long haus bilong mi "(I would like you to give me dsl to my house). Using a third language to bridge the gap to computer related issues... who knew! oh yeah.. God knew. 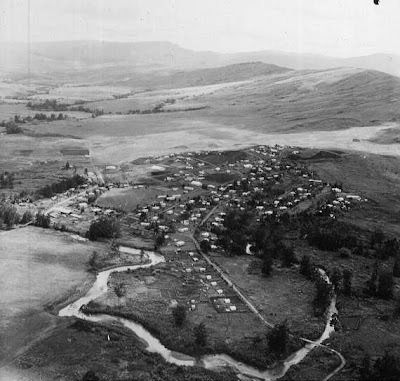 a Little thing I like to call "stock take"
This pic is of where I live, back in 1968, it has changed a lot since then. The departments here close for stock take every 6 months. So, the situation is, for the next week (or so), you can't purchase computer parts, groceries, electrical supplies, hardware, or any other work that you need to get done. Imagine if Mayberry closed for a few days. Normally that's fine, and it is fine, except that because of the rain we also can't escape off centre if we wanted to simply be... AWAY. If any of you have experienced the living-up-on-the-hill don't-have-electricity, huddle in the rain storms... it's fun as a kid. Still shooting marbles in the dark with my dad is a grand ol' memory. Although, the power hasn't gone out, and if it did, we have generators, so... it might be a nice weekend of curling up by the fire, listening to the rain, watching the lightning and reading books. Ever get in that mood... the ... rainy day mood. Well, this place has the rain... a LOT of rain... I've lived here 1.5 years now and I'm still amazed at how hard it rains. God has created some marvelous things. well it looks like the hard-to-define "dry season" has ended here. For 3 days it has poured BUCKETS of rain, taking a break for an hour here or there for intense sunshine. The river is rising, and the bridge seen above is not yet repaired. We've been bypassing the bridge with a ford, but the river is far too high now to pass. We were hoping the bridge would be repaired by now. It looks repaired, but is still impassable. We hope the rain dies down again so work can progress. Until then, we're confined here and supplies will be very difficult to bring in to us. Without being able to cross, we have to carry supplies across. You'll notice trucks on both ends of the bridge here. But the water fills our tanks, and we are thankful for that! Yesterday I came home after helping a neighbor raise his antenna tower to find my son and daughter huddled on the lawn over a plastic cup. "Dad, we caught a grasshopper and he's perfect for eatin!" -says my son. both he and my daughter were excited about this. The back story was that they came running into the house to get a cup from Kendal who said "go outside until your dad gets home because I'm not cooking up any grasshoppers!" So they did. I saw the grasshopper and said "son, your catch, your kill" and handed him a knife. "first you cut off the head, then pull off the legs, then the wings then you skin it and fry it up"
So I let him do that very thing, and he did too. So I, thinking he'd still chicken out, followed suit, we went inside, skinned it, and then I fried it in a pan. Cut it into 3 pieces and him, Syd and myself all ate grasshopper. I'm not sure we did it right, but we did it Calvin's way. You know people have told me they taste like peanuts... but to me honestly it tasted like grass. I am not sure we prepared the meal the right way. I'm not sure what it'd be, but grasshopper definitely ranks near the top. My daughter has joined the P.C. singers and had her first choir concert the other night. It was very enjoyable watching her sing her heart out and, even though a proud dad, I went assuming things would sound slightly off key. They were really good! The song choice was fun, the kids had a lot of fun performing as did we watching. 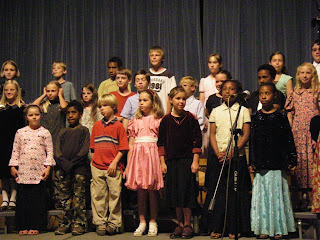 There was a lot of humor in the songs, and I appreciate the music teacher that came to teach the kids how to have fun while learning how to sing in choir. Also the 9th grade health teacher sent me an email with 13 others asking us to mock up a car crash so that her first aid students could practice. So we all hammed it up, fake blood, stuff like that. It was a lot of fun. I thought that I might be over the stop as I put together a home-made device to make it look as if I had impaled my arm on a tree branch, but when I showed up, others had chicken bones sticking out of their knees, head injuries, etc. It was really quite grim, but excellent practice for the youth. I do enjoy when a community can be creative together. 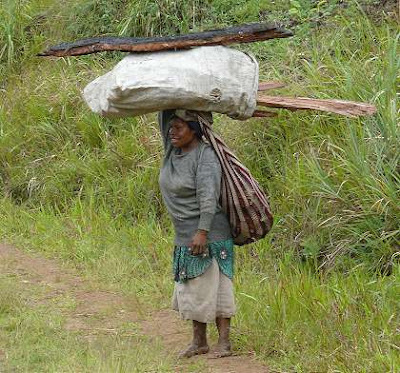 a PNG Meri (woman) carrying firewood on her head. This is a large load but not an uncommon site. I am here to fix computers. But that's not all I do. Recently I was given a project that few wanted, to show if I was capable of handling a large scale project. We need to move our programmers into a new building. Or rather a very old building. Which means there needs to be construction, electrical, networking, air con, and telephone work done. So managing the entire move is my side project for the past few, and next couple of months. It is interesting because I'm learning a lot about how to interact with the different departments here and how the mechanics work. But this morning I woke up thanking God because I realized, that with EVERY single job I've had since graduating college, I've been involved in a move or expansion. Typically I'm only handling the network side of the move, but there have been times when I was in charge of almost an entire move. I was thinking "wow it seems like I've done this a lot" and sure enough, every job I've had, I did it. I'm thankful to God because even this tiny forgotten part of my experience is being put to good use here. This week was a bad week for pets in our household. On thursday my son's guinea pig died, but it wasn't too traumatic for him. Today, (Sunday) someone broke the lock on rabbit cage and stole my daughter's bunny I think while we were at church. My daughter said to me through tears, "Daddy why did the raskols steal him on Sunday?" I said, "honey, sometimes the bad things or the bad people come and they want us to forget who God is, they want us to stop loving God by making us angry or sad. But we don't let them win, we love Him even more, because He loves us so much." You get these moments in life, when you are living, and they come unexpectedly. We didn't have the heart to tell her that the rabbit was someone's dinner now. And I hope I said the right thing when she asked about Sunday. Syd is fearful of earthquakes too, and we had a small one this week, she needed a little bit of comforting and then went back to sleep. Sunday was a very interesting day as I looked back on it. In my mind raced a lot of Scripture about hope, joy, suffering, love, and I had a lot of thoughts regarding our situation and lives. First, I am so very thankful to God for a very clear calling. Not everyone has that, not every 'missionary' has that. But this calling is so clear to us, that when the bad things happen, we aren't rocked onto our heals. We don't pray "God am I doing the right thing?" Our call, God's leading, gives us strength. We are convinced repeatedly that this is the right place for us. Second, today we laughed, and we cried. We had a great family Sunday, we played charades and catch and soccer, and tears were shed over the loss of a bunny. That's living right there. A day where you are drawn closer together, laughing, crying, asking tough life questions, and glorifying God. ALL that and it was our day off !!! Imagine what God is doing on the weekdays!!! So we're thankful for the unexpected, sometimes sad, weekend. We're thankful for the words of encouragement and the prayers we receive. I think our biggest requests right now, are for the people living here to have a sense of security, and unity. I personally sense we are on the verge of something and the enemy knows it and has turned up the heat a bit. We need to pray and not tire. "you'll be here long term?" I replied, "I'm here for a while, yes." that was a nice little encouragement, as she went out the door, the issue resolved. Yesterday I was on the phone to a place called Wewak, which is very north. They had a computer crash and were unable to get email. After an hour of troubleshooting the problem was resolved and they were able to continue working. The gentleman I was working with was in his 60's and wrote a simple little note of thanks over email. It is nice to be able to from time to time, realize that fixing these things for people has significant value. Today I expected to work from 8am to 5pm like usual. Last night the kids reminded me it was sports day, and could I come see them compete? Then at 9:30pm I got a call, "can you help move cargo across the river?" So a friend lent me their truck. I arrived at 8am and was asked to come back in an hour. 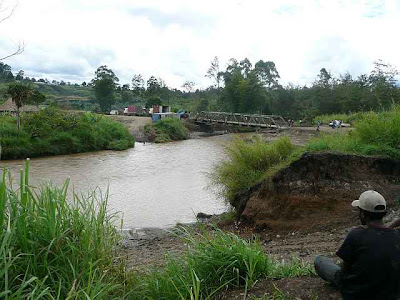 A big truck was making its way from LAE (a port) with cargo sent via sea, to Ukarumpa, but couldn't make it over the broken down (and being repaired) bridge. So the call went out for guys to drive and load cargo and bring it back. Since the bridge was out, the trip required crossing a river. FUN! Then I got back from that, had a quick bite for lunch, realized it was raining and I had missed most of sport's day, and now I see at 4pm I need to show up for worship service practice. Because we have no volunteers to run church, some people are volunteering last minute but unable to do the normal Saturday practice. (I run sound). Ironically my manager leaves for a week today, and I was in the office all of 3 hours by the time it was all over. Oh and now we have dinner at a friend's house planned, and tomorrow I have volunteer fire training. In the middle I need to construct a PVC puppet show stand, and finally I should be able to rest up in time to play my banjo for the preschoolers next week. ALL of this I had not planned as of 8pm last night. It never gets too dull around here! The cool thing is, that all of this is helping someone else, and all of THAT is helping Bible Translation. I REALLY enjoy how things change-up around here. Always some way to help. Once you get used to things changing frequently, it's a decent way to live. Me and my family have been helping [org]. Do you want to know why? Sure, ok I'll tell you. Their is over a million people who can't read the bible. they want to but they don't have one. Imagine over a million people don't have a bible so they borrow English Bibles, but they don't understand, wouldn't that be silly? So, my parents help. My mom teaches preschool. Why preschool? because My mom Likes to. How does it help? it helps so that when the kids grow up they can help too! My dad works at Computer tecnical servecise How does that help? it help so that translators can use their computer to help with diffrent Languages. My brother and Me help by going to school. How does that help? so that the workers at School get money and don't loose their job, and so that my parents can work, and so that when we grow up (if we want) we can help [org] too! So, that's my involvement in [organization]. Click on the link to see the latest video. This is the one I've been promising. We drove 6 hours to Kundiawe to see the 3rd largest language group in this country receive God's Word. The impact is a major one for a culture, some cultures recognize it at the beginning and throw big cultural shows, others have no idea how greatly their lives will be affected by God's truth. I liken this dedication to that feeling you had in high school when you knew graduating was a big thing, but you really weren't quite sure how big the world was yet, how much life ahead of you there really was. These people in this video know it's big, they jsut aren't sure how big and they seem almost cautious. It is interesting to watch. Enjoy. Sydney's 4th grade class was asked to present at chapel this morning. Each morning a different grade organizes a 30 minute chapel. The theme this time was "how our family helps Bible Translation". Sydney wrote a paper in class about our family and how her mom and dad help in translation, but then was asked to write a sentence to read in front of chapel. "Dad you didn't tell me you made a video for my chapel." "Miss Kirkham said she was going to show a video you made. Dad, you should have told me." "oh, well you've seen the video." "you should have told me dad." "I'm sorry Syd. I should have." Apparently she held this chapel thing quite dear, I had no idea. Kendal told me "In Chapel she's talking about you. Not us, jsut you." Sometimes you jsut don't know what is going on in the kid's mind until it comes out in a surprise. So one of the fabulous parts about living here is a 2 minute walk and I'm at her chapel, interrupting the work day for a whole 34 minutes is perfectly acceptable for reasons involving children. "My dad works at computer tecnical Servisces, so that translators can use their computers for studying about different Languages." Of course it isn't 100% accurate but it reflects me in her view which is always a precious thing to see. I think she got it from when I was telling her that one way (amongst many) that computers are used here is that the translators can search other language projects and look for similar languages to help them construct an alphabet. Yesterday our P.O.C. group threw a "We've been here a year!" potluck. Although we have been here almost a year an a half, we were still invited. 10 things you are thankful for. Kendal suggested also "10 things you thought you'd miss but don't". For example "I thought I'd miss Starbucks, but I don't." was hers. I was surprised by this because I hadn't read the email that told us to prepare, so I had to think quickly on the spot about these things. Always at the top of my mind of things I miss, is family and friends. Things like "hot dogs, movie theatres, pavement" these don't come to mind very quickly because they are trivial but always whenever someone starts thinking about things they miss, the family and friends comes to mind. Seeing ya'll babies born. Seeing your children grown. Nieces and nephews. Deep conversations and fun times with you all. Hugs. There's a place in me that gets sad when I look at photos, and I let myself go there rarely but I do go there to remember. So that is what we did this weekend. One thing I shared with the group was how thankful we are to be here. Our needs are met, and many of our wants. And then I encouraged them with some good encouragement we received. At the 1 year stage, around that time, there is a "wall". An emotional barrier of some kind that you hit that says "I don't like it here any more, I want to go home." I was warned about the wall by several people. It is as if the honeymoon suddenly ends, and you come to grips with the reality of living in a different culture. You get tired of the adjustment, and you feel like giving up. I didn't expect we'd hit that wall because we were loving this place so much. Everything about this place made us very happy. And then, without warning, about 5 months ago, we hit the wall. I remember conversations that are best kept private between my wife and I where we were both utterly discouraged. Lack of close friends, frustration with the culture here, a desire to contribute more, do more, missing family and friends, confusion about our kids' future. All these things. It was all roses until that time. But the thing was, we knew what it was. So we didn't even once talk about giving up or heading home. We talked about how much of it was valid and how much was an enemy attack. We prayed, we felt bad, and we jsut waited. At the end of it, if I can call it a trial by fire, we simply seemed to understand more maturely. More deeply, the work that we have here. I liken it to a ride at Disneyland. As a kid, the ride is magic, you don't know how it works and it's fun. As an adult you understand the mechanics, you don't see the magic, but you appreciate the work put into the ride and enjoy it. Each way you enjoy it differently. One way you enjoy it, with your eyes open. That's where we are now. We are enjoying living here and serving here with our eyes much more open now. Many people do not get through that wall, and they do go home. We encountered that while trying to raise support to come here. There was trepidation that we might give up, the statistics show that it happens a large percentage of the time, and a growing percentage with each new generation. But we haven't yet, I believe we've pushed through that wall, with prayer, drawing close to God, and with the support of friends and family like you. So now, 5 months later, I look back and am thankful we went through that. I'm thankful we can warn these friends of ours of what is coming, and hopefully prepare them like we were prepared. God is amazing us daily still! We see his hand at work. I'll blog a story soon about some encouraging aspect of life here. Until then.. this again was too wordy.. but was a long time in the writing. You know we're here supporting Bible translation, and you know we do that through our jobs as well as our side ministries and personal relationships. One of our friends, a translator, told us this story. Translators here go about their work in a few different ways. One of the ways is that they build a team of nationals who understand the language and are willing to work on Bible translation. These people are essential to the ex-pat understanding the language and the side-result is the relationships that form. Sometimes it takes a very long time to build such a team, and sometimes these teams can fall apart. But our friend has a good team. One man through this process has had his life changed by Christ. In a culture where wife-beating is acceptable on man's wife was giving birth and he did a remarkable thing. He stayed outside the house all weekend singing praises to God and praying for his wife and new baby boy. He was tender with her, devoted to her, encouraged her. That is a very very rare thing to see in this country and is evidence of Christ changing lives. Slightly embarrassed at his own tenderness he told none of his friends about the birth or his actions, but raced to my friend and secretly told him. You can spend your life working to share Christ with a nation, a culture, a people, a person, and not get this kind of reaction even once in your life. He said, "I've never felt close to God like that, God truly does answer prayer, I prayed that my wife would be okay, and that she would give me a son, and she did!" What a great encouragement! What a remarkable testimony! Kendal and I get excited to see the translators excited! There truly is a lot of passion that goes into this work. There is a translation workshop that has been going on. This is where the translators get together with the local language speaking people who are working with them (nationals) and work on getting books of the Bible translated. In one area, there is a lot of trouble going on during this workshop. The specifics will be too much for this posting, but I'll stick with generalities. Evil is still very prevalent in this place that's been working on the translation of the New Testament for 5 years now. The translators are coming under a lot of "hevis".. a lot of problems. A national from the village had his head cut off. We haven't heard details or of it is true yet. ==>Reason: 5-pela man ol i bin pasim tok na kukim haus bilong mi. ==>So mi Joe ilaik take revenge anytime bihain long translation woksop. ==>Reason: Five men all agreed together and burnt my house down. Just a clarification: [He] is not asking for prayer to help him take revenge. take revenge, and that he would know how to respond to this offense. I am always cautious what to share here because I do not want to paint the country in a bad light, or make it sound like what my family is doing is very dangerous. This is the experience of a translator couple we support in their village. This is going on far away from my family but still a reality as we support these people and pray for them. Evil is strong here in many places, which is why we strive to bring God's Word as it transforms lives, cultures, nations. We've seen it happen, that when a New Testament gets translated, and people are taught to read it, that they change from violent and evil cultures into God fearing ones of peace. It is truly a miraculous thing to witness! Pray finally, that whatever the outcome that the translation workshop continues to progress and that nothing stops it. Often times, if there is a problem with someone working there, then the workshop can become targeted as well. Thank you.. and I know it's a long post, thanks for reading. Last night, I fell asleep, it was nice. I was woken up by a beeping that indicated full power failure. I got dressed, 11pm, and headed up to the network room. Groggy headed, I shut down all the servers (when the power goes out I have 30 minutes to bring all the servers down before they reach critical temperatures), made a few calls to get the industrial guys to bring the generator online. Soon power was back on, the fire drill was over, I brought the servers back online. Power has been out for 3 days, the generator had been running all weekend and the fuel ran out. Anyway today I helped some translators, and I don't know how this escaped my attention until now, they live on "Goodenough Island" and for some reason until today I had pronounced it "Good E Know"... for some reason it jumped out at me today and I laughed..
Calvin is excited about 2nd grade. Sydney is cautious about the teacher change, but said "I'm glad I'm going to school because when my kids ask me questions I need to know the answers." Kendal started teaching again, I can see the smile on her face. And we have had a bit of a quieter week than last week... well we had 1 interruption in the network... well two.. but still today was quiet. I have been meaning to send out a newsletter soon, but I have not. If anyone has feedback as to what they'd like to see in a newsletter let me know. If you have a chance, pray for energy for us, we need to get a little bit more of it. Another thing we saw was the LAE war memorial. 2806 souls were buried here, all contributing to WWII efforts against the Japanese invasion of LAE. Most of them were Australian. It was a pretty and somber place in the middle of an otherwise busy and cluttered city. And to conclude our tourism we went to the Rainforest Habitat maintained by a university outside of Lae. It was the closest thing to a zoo we've seen in a while. Imagine a very small zoo, with no one around. And then add to that the oddness of being in a manufactured rainforest, inside a rainforest country. It did have the benefit however, of having a lot of really beautiful bird species all in one location. The kids enjoyed the parrots who mimicked laughter and said hello as well as other things in Tok Pisin. The equivalent here of "polly want a cracker" is "koki kaikai". Pictured here are two tree kangaroos we watched for a bit. This weekend we were driving and found this Crocodile Farm. I had heard of it, but hadn't been able to arrange a visit, so I stopped in, and asked them if they could give us an impromptu tour of the place. 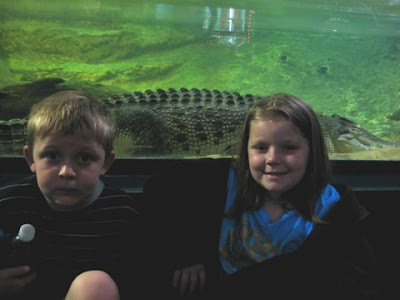 They were very obliging and so my family got a quick tour of the Croc farm. The farm hosts 48,000 crocs they breed for the skin. 80% of the revenue is from selling the skins to the Australian market, 20% is from selling the meat. We love the meat. Imagine lobster texture with more of a chicken flavor. It's tasty. Apparently the market for croc skins is booming and they're expanding. They showed us and told us specifics on how they raise and separate the crocs. But they do not let them reach full adulthood because of the laws regarding skin sizes, etc. It was a tour certain to offend animal rights lovers. Going there we had no idea they bred them for the skins, honestly didn't know what to expect. Still, seeing that many crocodiles up close was a sight to behold. LATER at the rainforest habitat we saw a full grown adult male croc, named Agro. HE WAS HUGE!! This weekend we went to LAE, a major city about 2.5 hours driving time away. It gave us a chance to recharge a bit, rest, and swim. We went into a grocery store, and I have always been interested in their marketing ploys, and I think I've blogged a few. For example, if you buy a jug of orange juice, it comes packaged with a "free cup". Sometimes you buy tuna, and it comes with a box of matches. Of interest to my son was a bottle of cooking oil, packaged with 3 lollipops. He took this to mean you're supposed to coat the lollipops in oil and was disgusted by that thought. But the winner, and the reason I wish I had a camera on me at all times, was the box of cookies coupled with a free box of rubber bands. I didn't get the connection, but what is worse was the brand name of the rubber bands. First someone in a room said "you know what would REALLY sell these crackers... FREE rubber bands!" but to have it say "Swallow Rubber Bands".. in the States that'd be a lawsuit waiting to happen. I mean, it was packaged with an edible item no less. 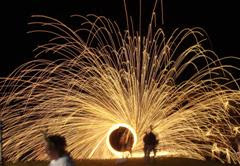 This is what steel wool looks like when you light it on fire and swing it. We can't get fireworks here, so we silently swing steel wool. I've been trying to name this. "Steel slinging" or "Wool spinning" but it hasn't caught on yet. I also have been whistling and smacking my hands together to simulate firework sounds, but that hasn't caught on either, although I did get a couple of chuckles. This 4th the Americans got together and lit sparklers, spun steel wool, played music and barbecued. We tried to forget that the beef doesn't really taste like beef and that the hot dogs have a really tough skin. But after being here long enough, it's easy to do, you get used to things and it isn't until you have a visitor over that you remember how it was when you first arrived. It was fun to have friends visiting around this time of year. This picture might be of me and my first time Slingin' Steel. Take two pieces of steel wool, poke a long wire through them and bend it back. Tie the wire to a piece of rope about as long as one of your arms. Go to a big open area as the wool spits. Begin spinning slowly, so that the wool will ignite and not burn out, then spin faster and faster unti lit starts spitting, then as fast as you can. The faster you spin the sooner it burns out, so finding the right spin speed for the effect is really where all the work is. 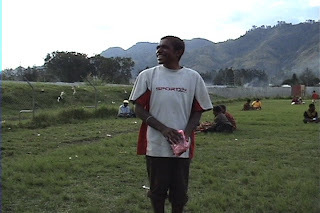 I met this boy in October 2004 when I visited his village during a 3 week visit to PNG. He was a close friend of the translator family whose village house we stayed in for 3 nights. During those 3 nights, Kamie and I played games, laughed, and had fun. 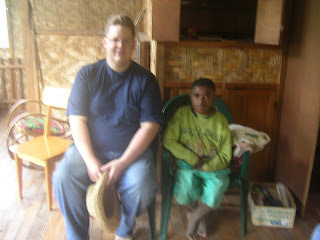 He was my first Papua New Guinean friend even though we didn't understand each other's language. My family goes through training, raising partnership, applications, moving, and arriving in PNG. More training, more moving, and finally settle into our work here. Then the news comes that in June 2008 we will be dedicating the Kuman New Testament. This N.T. is in Kamie's language. The translator family that I visited 4 years ago, had completed a major work, and there was to be a celebration. I hoped to go, and I hoped Kamie was there. He was, I found him, and we spoke, I was amazed at how much he'd grown, but even more, at the smile on his face. 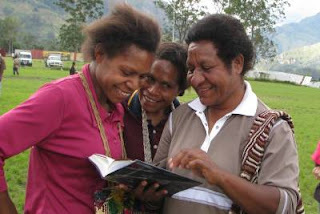 For Papua New Guineans, having a smile like that is a rare thing and later, I was left to wonder if the Word of God was one of the reasons for that smile on his face. I should have asked him about that, I missed my chance. Life sometimes comes full circle, and it was good to see him grown to, about 17 years old we think. 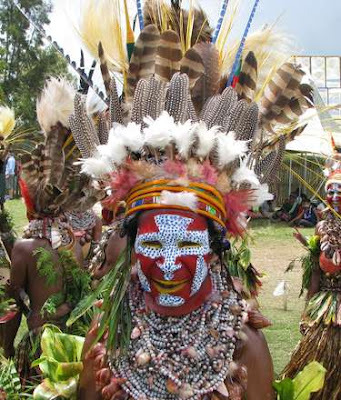 Life for a Papua New Guinean is hard, and smiling is not their default facial expression. But Kamie had a smile that wouldn't stop, and even though we were celebrating 18+ years of Bible Translation work (it took that long for this N.T. ), I realize that simply by living the translator family had an affect on the people around them. Sharing God's truth, living as an example, caring for others. Kamie's smile symbolized to me how simply being here is affecting the world for God's glory. The last few months have been sort of a marathon for us. Our bodies and minds are tired. Emotionally we are tired. It seems that issues here weigh heavily on the heart and emotions can really tire you out, at the same time, cause you not to sleep. If you could pray for energy and guidance. We were hoping for a spiritual re-vitalization at the recent Bible Dedication, but found that instead, the emotional impact of seeing people receive the Word was overwhelming. The physical impact of the journey plus that emotional impact, plus the fact that we didn't get much sleep, left the experience less than energizing. Right now, our bodies and emotions are taxed and we need rest. We also need God to be declared in a big way right now for us. We need Him to show us exactly where Kendal should be serving this school year and how. Right now it's a bit of a mystery, in flux, as are many things with the school, and that is also another drain on emotions and plans. If you could pray, pray for these things for us. Thank you. a year ago my son and I went on a gumi ride down the river near our place. A gumi is an inner tube, or anything rubber really. On said ride, we bottomed out, capsized, got separated, it was quite the adventure. About a month ago the kids wanted to go on another gumi ride... I wasn't up for it, so... I came up with a different solution which they loved!!! this video is 3:40 long. In an effort to be brief, I'm splitting the Dedication trip up into several posts. We went to our very first NT Bible Dedication ceremony this weekend. WE didn't know what to expect and we've heard wild stories about dancing and singing and feathers and paint. The Kuman culture seemed a tad different, they enjoyed long speeches and they sang and smiled and gathered and clapped. The ceremony ran a tad over 3 hours, lots of speeches and sermons, and then was followed by the arrival and opening of the Bibles. People lined up to get theirs. Afterward our group split into smaller church visitation groups, and we went to have dinner in the local homes. Then it was back on the bus for a 5hr30m trek across the highlands where we stopped to get some "bilas" (decoration) for the trip home. Emotionally seeing this Bible in their hands, and realizing how many people God worked through to bring this book to fruition over 20 years hit like a load of bricks... I got choked up and my eyes welled up a bit. I was explaining to my children how the people back at home were part of the team that did this book and even though it was started 20 years ago, we as a family were helping for the last year and a half. We played a game of him naming names and me explaining how they helped. Some of you were named, and I could see the light bulbs going off in my kids' heads as they realized how many people it takes to make something like that happen. I can not fathom not having the Bible in my language. It is something I had since I was born. I was read to in the womb from the Bible. I simply can not fathom how these people will be impacted. God is wonderful and HE deserves all the praise for this work. My Korean neighbors recommended their yard man to me for a 1 day job which required a lot of bush knife work. So I hired him, he did good work. She came to visit and my wife and I are still trying to figure out the purpose of the visit because of the language barrier. Her English was broken, my Korean doesn't exist, so we lapsed from broken English into broken Tok Pisin and had a conversation. I believe we ended on good terms and everyone happy, but at first it seemed like we had a real conflict, until I realized she was being a good neighbour and simply checking up on things. I was thankful for that third language that we had in common. This Friday we get to leave for our first ever Bible Dedication! This is a huge celebration thrown by the people receiving the Bible in their language. This dedication is the fruit of over 15 years of work by the translator couple and the same amount of time from all the support staff. We hope to sing praises, celebrate, and join with the Kuman people in their excitement about receiving this New Testament. I hope to have pictures and video later. It'll be a 2-3 day event! A hevi is a burden... something bad that has happened to people that puts them in a position of needing help. Anything that weighs heavily on your spirit. It seems to me that there has been an increase in 'hevis' this month. People getting sick, people burning the candle at both ends and losing patience, conflicts, broken bones and pulled tendons, financial woes, lack of visas, vehicle failures, moving stress... all of it. I do not know if it truly is an increase or if I'm simply having more open eyes to it than usual, but either way the response is prayer. God has been protecting us and comforting us, but friends all around are having these hevis, as are we. PLEASE pray. Someone said to me "it seems like the enemy is gaining ground on us, and I don't know why." We are wrestling here, and we need more prayer. It doesn't feel as if we (the center) have enough prayer cover and I do not know why that is, but I'm asking you all to pray for the entire center her, for an overall withdrawal of the enemy, of these hevis. It would take all day to list all the issues and concerns that are hard on people here right now. So if you can blanket us in prayer we would greatly appreciate it. And thanks to God who provides! 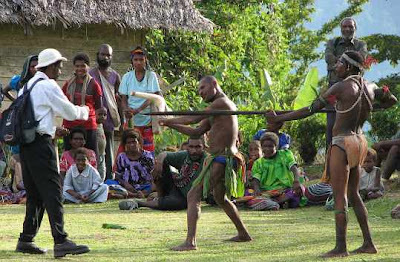 a Mumu is a PNG traditional feast. It is similar to a LUAU in how they prepare the food. A hole is dug in the ground, hot rocks are placed in it, then the food wrapped in banana leaves and the modern version ...tinfoil. Then placed in the ground, with hot rocks on top. Fresh garden vegetables and some meat, cook in coconut juice. Typically it is a celebrational event, and this one was for some friends leaving. Our haus meri and friend threw it, invited us, but the rain was so bad, we hosted it at our house. The food was very tasty. Typically mumu food is bland, as is most PNG food to an American. But this food was very tasty. Potatoes, kaukau, taro, corn, kumu, sausages, all very good. To make the event more festive, I pulled out my banjo and that sort of broke the ice and the crowd got to talking. We called it a "good ol' down home, country MuMu"
One option for translators to live in the village is to build a kit house. Some go for this option, and it is quite the undertaking. take a look at this picture and tell me... how big the manual must be!? Right now we have several construction people in the villages helping translators build houses. Houses in which they'll stay to get accustomed to the people the language, and begin translation work. had an emergency down in the hf-radio site... an hf radio fried a whosit (electronic doodad).. think it's called a relay. While down there, in this big metal box, I went to call out... to see if I had fixed it... and the phone didn't work. I opened up the phone... plenty of cockroach evidence behind. they ate the glue off the ribbon cable that connects the dialer with the phone circuit. Pushing the numbers wasn't working. so.. I wiped it clean.. re-attached the cable... bingo. That right there is a $20.00 phone (cheapy cheapy) saved from being used for parts. a friend/customer/co-worker came in and said "I need a female to female 3.5mm stereo adaptor"
wouldn't you know it, we were all out. So I began to search our inventory trying to figure out how to do this. They were trying to rig up a system to show the AIDS awareness video and have sound. Well, I found one part, that if you added it in conjunction to like 5 other parts, it might work... and then I had this.. "out of the box" moment. And gave him an odd little end. he looked at it.. and looked and said "aah I getcha..." the translator working next to him said "wow that's really missionary 'out of the box' thinking... I like it!" later today someone else said "wow that's really thinking out of the box"
so I guess today... was my out-of-the-box day.